Top trout fishing guides in Montreal recommended by Freshwater Phil. Though the immediate waterways in the Montreal region don't contain much trout, a couple hours drive either to the Eastern Townships, or the upper Laurentians, will provide you with some of the best lake trout, brown trout, rainbow trout, and landlocked salmon fishing in Quebec. Aside from catching big, tasty trout, you'll enjoy being out in nature in the foothills of the Appalchian or Laurentian mountain ranges. 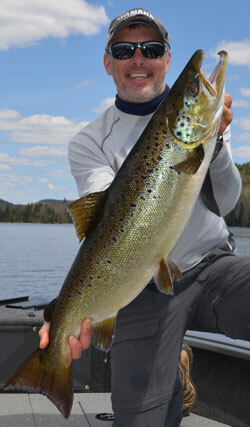 Fishing for trout and landlocked salmon in Quebec, is season specific. Early spring is trolling time, using light gear and streamers, small spoons and crankbaits. As the trout go deeper in summer, finesse jigging with the aid of high tech electronics takes trout fishing into another dimension. Trout fishing season opens late in April the Montreal region, guided outings are available all the way through mid August, just before the season closes early in September. Techniques: Spring = trolling, Summer = finesse jigging. Best time: Late April until mid August. 3 people maximum.350$ for 1-2 people, 450$ for 3 people.